At our Thanksgiving feast we always have some dishes with roots in my Italian heritage. We start with antipasti, then the stuffing, with Italian sausage and mushrooms, is of Sicilian origin. We roast chestnuts in the fire while we serve dessert, which also includes a bowl of fruit – pears, prickly pears, clementines, pomegranates. In the past I’ve sometimes served a pasta course before the turkey and trimmings, but some family members don’t like to fill up on too many courses before the turkey. Since I still need a bit of macaroni on Thanksgiving, for the last few years I’ve made a small pan of pasta al forno (baked pasta) and serve it as a side dish with the turkey and trimmings for whoever wants or needs pasta, too. I assemble it a day or two ahead of time, then heat it through on Thanksgiving Day. The recipe is very versatile. You can use ground beef instead of sausage, or ham and peas, fresh ricotta, olives, sautéed vegetables, artichoke hearts, or greens such as spinach or chard. You can make a cream sauce instead of tomato based. You can top it with breadcrumbs. I prefer to keep it simple with only sauce, a bit of sausage and lots of cheese since there are other rich dishes on the table. The choice is yours. Tastes great the day after Thanksgiving, too. Preheat oven to 350 degrees. Heat sauce of your choice and, while it is heating, boil water and cook the pasta for about 10 minutes. You want the pasta just a little firmer than al dente because it will continue to cook in the oven. Drain pasta. In a large mixing bowl combine hot pasta with roughly 4 cups of heated sauce. Stir to mix well then add mozzarella and grated Parmesan cheeses. Mix. Cut sausage links into thin slices. Add to the pasta along with oregano and salt and pepper to taste. Mix well. Spread the last cup of sauce into the bottom of a 9×12 pan. Pour pasta mixture into pan and spread to the edges. Cover pan tightly with foil. Bake for 30 minutes until hot and the cheese is melted. It may take a few more minutes, depending on your oven. Remove from oven. Let pasta rest for 5-10 minutes before serving. Serves 6-8. This entry was posted in Christmas, Easter, Pasta, Sauces, Thanksgiving. Bookmark the permalink. 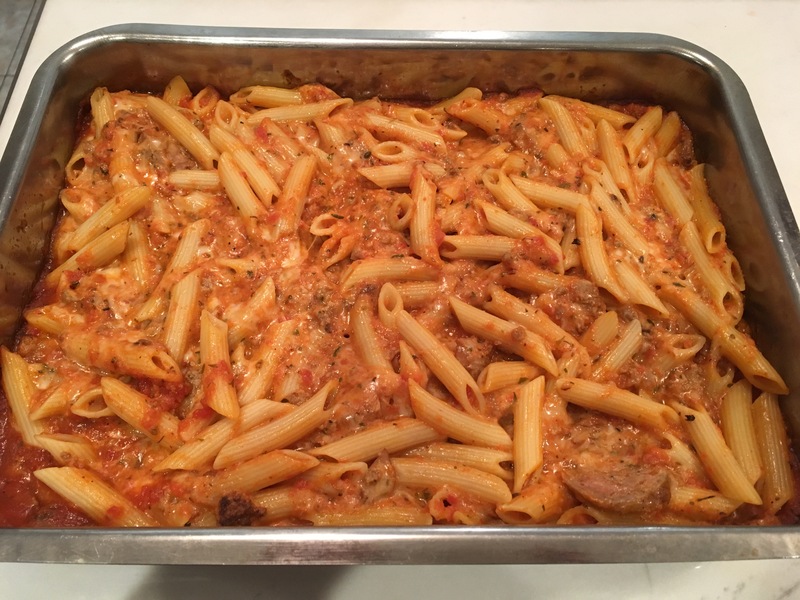 This is very similar to my baked ziti recipe. I’m sure I’d like your recipe. Looks delicious!